Vengo - How to keep my fuel costs under control? How to keep my fuel costs under control? The biggest expense for any driver or transporter is fuel – no doubt. Depending on your vehicle and route, your diesel consumption can take a bite of 15 up to 25% out of your transport budget. More than ever, being economical with fuel is the message. Luckily, you can keep your expenses really well under control with the competitive Vengo fuel card. If you use Vengo’s transport platform as a business user, than discover all the advantages of our fuel card! Vengo has signed an agreement with TOTAL, one of the best-known and most renowned fuel suppliers on the market. TOTAL has indisputable technical expertise when it comes to fuel consumption, thanks to the efforts of over 550 researchers in various research centres. Also, their strong partnerships with various car and car equipment manufacturers contribute to their extensive knowhow. In addition, TOTAL supplies fuel to i.e. Formula 1, where quality is an absolute top priority. In brief, TOTAL is simply great. By grouping the purchasing volumes in our community, we managed to get a discount of 13.31 Eurocents (incl. VAT) on every litre of fuel taken of the pump in Belgium – and this for both diesel and petrol, and at any TOTAL petrol station (also along highways). Normally, this discount is limited to fleets of more than 100 vehicles. But via Vengo, you can get this discounted fuel card even without any volume requirement. Do you fill up at the end of the street? Or do you use your fuel card only in emergencies? No problem, even then it’s an interesting option for you. TOTAL has the most extensive network in the country. With more than 530 petrol stations in Belgium, you will always find one near. It also doesn’t matter at which TOTAL station you fill up, because you can benefit from the great conditions at any Belgian petrol station and for any type of fuel. So, no more driving around to find the cheapest fuel. Both in your own region and when on route, you will always enjoy an interesting discount at the pump. Are you sick and tired of keeping those annoying fuel receipts and sending them in at the end of the month to get an invoice? Or do you just want to pay all your refuelling in one go through a single clear invoice? It’s possible. With the TOTAL fuel card, you have a simple and clear way to stay on top of your spending. 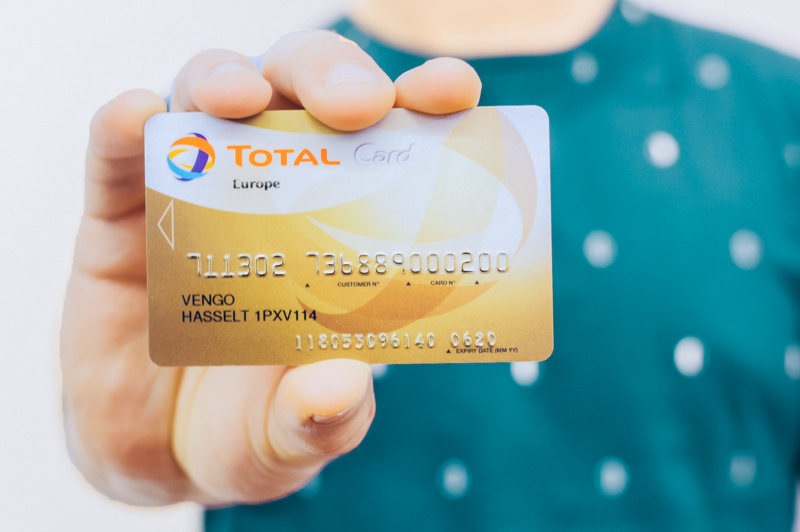 Every fortnight, TOTAL sends you an invoice directly and will credit your account for the amount you consumed. Should you still encounter any problems with your invoice, then TOTAL’s very extensive and friendly customer service is available to offer you first-class service. If you become a member of the TOTAL Club, you will benefit from additional advantages, such as TOTAL Assistance. This free road side assistance is valid for three weeks every time you refuel at least 25 litres. In addition, you can collect TOTAL points to spend at petrol stations, and you can enjoy plenty of promotions and discounts in all petrol stations and at LunchGarden restaurants. On top of that, TOTAL regularly launches nice competitions with interesting prizes to win (i.e. free fuel or even a car). Fantastic! First of all, register as a Vengo user and download our app on your iPhone or Android device. Complete your company details, so we know your company name, address and VAT number. Next, you can request your TOTAL fuel card via our contact form. Complete your details, and in the open field enter ‘Vengo fuel card’. Our team will contact you as soon as possible. Upon mutual agreement, your registration is completed, and there’s only thing left to do: drive! You will receive an email with a link to confirm your subscription. © Copyright 2019 Vengo. Terms and Conditions. Salamander Media takes care of this.